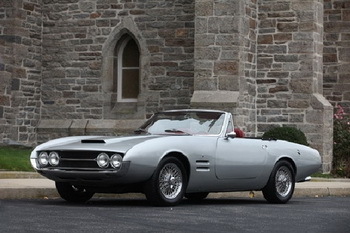 Desired in its day by Hollywood's A-list celebrities, just 52 of the Giorgetto Giugiaro-designed Ghia 450 SS convertibles were eventually built through an usual partnership, and one of the survivors of this overlooked classic is set to go under the hammer at Gooding's Scottsdale Auction later this month with an estimated price of US$125,000-175,000. In an uncanny link to the present day, the Ghia 450 SS in effect mates a Fiat-inspired design to a Chrysler chassis. The legendary tale of the Ghia 450 SS began in the early 1960s when famed Hollywood producer Burt Sugarman spotted the Ghia-bodied Fiat G230S Coupe on the cover of the latest issue of Road & Track. Mr. Sugarman was so taken with the clean modern lines fashioned by legendary Italian designer Giorgetto Giugiaro that he contacted Ghia in Turin, Italy. 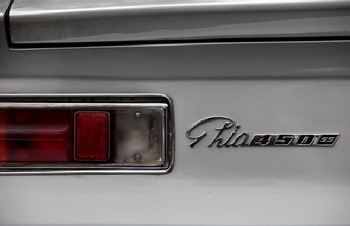 In an amazing feat of persuasion, Mr. Sugarman managed to convince Ghia to create a limited-production convertible based on the Plymouth Barracuda and he then formed a new company, Ghia of America. 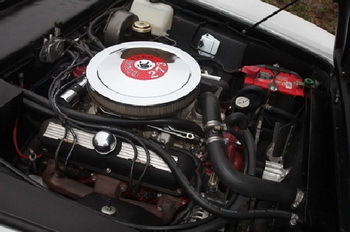 The exotic cars, which were fitted with a 235 bhp Mopar 273 CID OHV “Commando” V8 engine coupled to a 3-Speed TorqueFlite automatic transmission and used many other Chrysler components, were each listed for over US$11,000, a staggering sum comparable to the most expensive Ferraris, Maseratis and Rolls-Royce. By the end of production, only 52 of these beauties were completed, and all were sold through an exclusive Beverly Hills dealership. It is no surprise that many of the Ghia motorcars were originally owned by celebrities, including Johnny Carson, Wilt Chamberlain and, of course, Burt Sugarman. 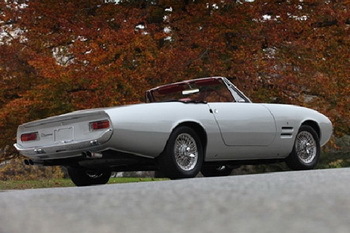 Set to be presented for bidding at the annual Gooding & Company Scottsdale Auction on Saturday, January 23, will be one of the finest examples of this rare Ghia Convertible known to exist. It is reported that this stunning 450 SS has been treated to an impressive ground-up restoration under the supervision of a California-based Ghia enthusiast. Apparently, this gentleman would find one great Ghia-bodied car at a time and restore it to the highest of standards. Finished in silver with an eye-catching, cinnamon-like leather interior, this particular 450 SS truly looks the part of a late-1960s boulevard cruiser and, in many ways, is quite comparable to the legendary Dual-Ghia, one of which is also to be consigned at the Scottsdale Auction. The current owner, a collector of some of the finest coachbuilt automobiles, purchased this car out of California and it has since been lovingly maintained in his collection. The car is said to be a thrill to drive and one can get lost marveling in its many unique features, from its push-button door handles to the bespoke instrumentation. Although the clean lines and modern conveniences give this car a great mid-century feel, its chrome wire wheels, inimitable style and custom-built status hark back to the time when automobiles were individually fitted and designed for their owners’ tastes and needs. Of the fifty-two hand-made 450 SS models constructed, approximately half are known to survive; however, very few of the known examples have been the subject of such a high-quality restoration. Moreover, rarely do these fascinating cars appear for public sale, making this a unique and exciting opportunity. 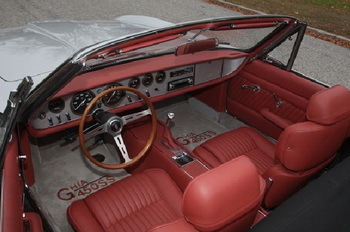 In addition, this Ghia is offered with an original factory brochure that outlines the specifics of the rare 450 SS. One of the most fascinating and evocative automotive stories of the 1960s, the 450 SS will also be remembered as one of the last Ghia – if not the very last – Ghia-produced automobiles before the company was taken over by Ford. For the collector who enjoys a great conversation piece, a wonderful story or a distinctive coachbuilt sports car, this sublime 450 SS should appeal on every level.